College is a time of personal growth and discovery, especially at Greendale Community College where teenagers and seniors alike converge to seek education and learn who they really are. 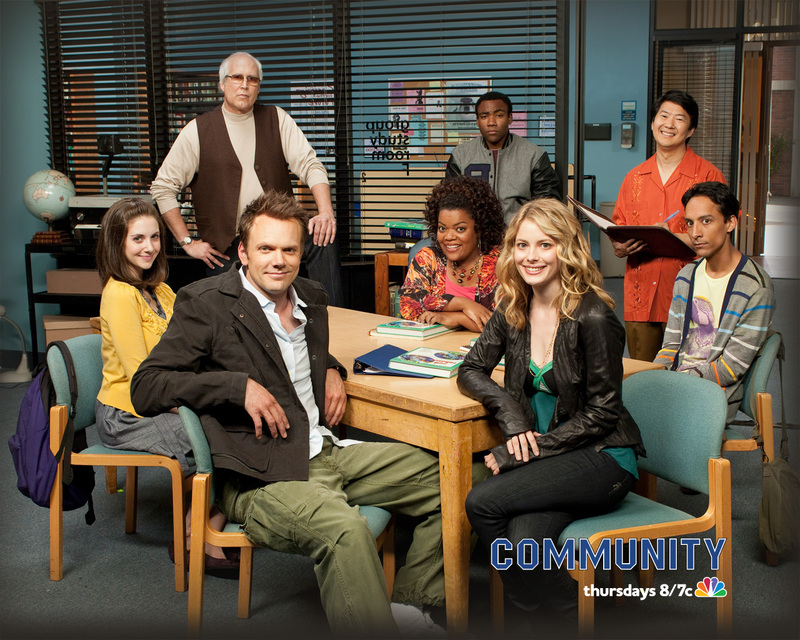 Greendale, the setting for the NBC sitcom Community, also serves as a haven for losers on their last chances. Called a "toilet" by its own students and promoted by the slogan, "You're already accepted! ", the school provides a constant reminder of its denizens' past failures and lack of opportunity for the future. Greendale is a place, however, that allows for hard-won self-improvement. Some metamorphoses are just lateral movements - witness Ben Chang (Ken Jeong), who transforms from an incompetent Spanish professor to an incompetent math instructor. But the "Greendale Seven" study group members draw on themselves and their fellow students for courage and support in becoming the people they want to be. Set your goals and pursue them vigorously. Shirley Bennett (played by Yvette Nicole Brown) entered Greendale after a traumatic event in her personal life. When her husband leaves her and their two sons for a stripper, she decides to attend community college to gain independence and a life outside of being an unappreciated homemaker. Shirley gains experience in cooking and promoting her own products. Her efforts culminate in the opening of Shirley's Sandwiches, a small business she starts on Greendale's campus. While she eventually reconciles with her husband, Shirley achieves personal growth and finds her own happiness by taking chances and discovering new skills that empower her. Don't be afraid to change paths. Annie Edison (Alison Brie) is your typical high-achieving, straight-A student - minus the Adderall addiction that landed her at a bottom-tier community college. She takes academics seriously and keeps a laser focus on the lucrative hospital administration career waiting for her after Greendale. We see periodic signs, however, that Annie is second-guessing her plans for life. And when a class-project yam is destroyed, causing the study group to band together for a Law & Order-style criminal investigation, she realizes a new interest. After graduating and finding no fulfillment in her healthcare industry job, Annie re-enrolls in Greendale to pursue her passion for forensic science. She throws away the rulebook that has restricted her throughout life, and embarks on a new journey that excites and challenges her. Keep your values along the way. A disgraced lawyer who lost his job for lying about his non-existent college degree, Jeff Winger (Joel McHale) creates the study group merely to hook up with his first recruit, Britta Perry (Gillian Jacobs). His egotistical attitude leads him to act aloof and aim sarcastic barbs at group members who look up to him as being cooler and better than they are. Even after growing close with the other students, Jeff often struggles to prioritize his friends over his own selfish desires. His better angels consistently win out, however, as Jeff routinely postpones whatever he'd rather be doing to serve as a father figure to a group desperate for his leadership. He makes time to support Annie's creation of a Model U.N. group, provide Shirley with pro bono legal help, and throw fellow group member Abed Nadir (Danny Pudi) a Pulp Fiction-themed birthday party. Even when he gets his life back on track, Jeff maintains tight connections with the classmates he once treated with contempt. These outcasts become a surrogate family for a man who finally learned to prize friendship over wealth and professional achievement. It's never too late to become the person you want to be. Pierce Hawthorne (Chevy Chase) serves as a constant reminder to his younger cohorts of where poor decisions and failed relationships will eventually lead. He treats his fellow study group members with disrespect, then complains that the study group leaves him out of their outside activities. This vicious cycle leads him to act maliciously toward his friends, further driving a wedge between himself and those who should be closest to him. After his frustrations boil over into physical aggression between himself and Jeff, Pierce begins to let others into his heart. He sticks up for his fellow students when he believes they are being bullied, dials back the racist/sexist comments, and even saves Greendale from financial ruin by winning a campus-wide paintball competition, then giving the destroyed school his prize money. Pierce waits until after his own death, however, to openly share his feelings with his friends. In his written will, Pierce posthumously tells Shirley that he admired her business acumen and strength of character, and reveals that Britta's passion for her various causes inspired him. He also provides a life-changing opportunity for Troy Barnes (Donald Glover), who realizes that Pierce saw something in him that he never saw for himself. Accepting the friends he once kept at arm's length, Pierce makes continued progress (even into eternity) in becoming a more considerate and appreciative person to those who care about him. Challenge yourself. The show's biggest transformation is made by Troy Barnes (Donald Glover), an obtuse ex-jock whose stated ambition is to wait until his best friend Abed strikes it rich with a social media innovation, then sue for a cut of his fortune. While the other study group members mature, Troy remains content to watch unwatchable b-movies and co-host Troy & Abed in the Morning, an early morning television program that no one bothers to film. But his stagnancy is shattered when Pierce offers him $14 million in stock options if he successfully sails around the world. Pierce tells Troy that he sees in him the "heart of a hero," and challenges him to become the man he knows he can be. Whether induced by the lure of money or the opportunity for personal growth, Troy accepts this offer and sets sail with co-voyager LeVar Burton (per another provision in Pierce's will). True to form, Troy cannot say goodbye to Greendale without playing an increasingly ridiculous game of "the floor is lava" that symbolizes his rite of passage into manhood. But, eventually, he sheds his lethargic state of no expectations and evolves into an adventurous adult whose best years are just beginning. Reinvention doesn't require enrollment at a community college that prides itself on its "Straight A's" (two of which are "Air Conditioning" and "A Lot of Classes") or which offers "certificates of completion" due to being legally prevented from awarding diplomas. The Greendale study group members demonstrate that setting goals, keeping an open mind to new ideas and opportunities, and recognizing the worth of those around you can help you live the life you want.